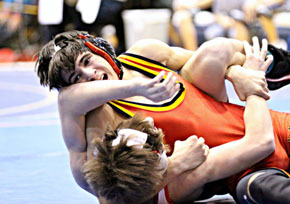 Three Boone Central Cardinals – juniors Bobby Stopak and Jacob Meyer and freshman Jackson Meyer – will cap their seasons at the 2011 Nebraska State Wrestling Championships Feb. 17-19. Stopak (112 pounds) placed 3rd in last weekend’s C3 District meet at St. Paul and the Meyer brothers each finished 4th, earning coveted trips to the Qwest Center Omaha. Although the Cardinals were well down in the team standings, Coach Dale Bonge said it was a successful district weekend for his young wrestlers. Stopak recorded two falls and a major decision victory during a very strong run to 3rd place. Jackson Meyer had three straight pins to earn his trip to state and Jacob Meyer also won three times to qualify in a tough weight class. “Bobby was again our highest place winner. His only loss was by a 2-1 score in the semifinals,” Bonge noted. “There were some tense moments however. Bobby was behind entering the third period of his opening match before catching his opponent in a ‘Zinger’ and getting the pin. In the ‘heartbreak round’, he turned another tough match into a pin to punch his ticket to Omaha. “Jackson was only seeded 7th. After dropping his opening match to the #2 seed, he came back with a vengeance, pinning his next three opponents in under a minute,” Bonge continued. “His biggest win was in the heartbreak round where Jackson pinned Rickert of Wood River, a guy who had pinned him in 38 seconds earlier in the season. Bonge was also pleased with the district efforts of other Boone Central competitors.